Six months ago the United States almost got universal health insurance. Advocates celebrating the passage of the federal health reform law argued that this was as good as it gets. While it was understood that the optimistically named Patient Protection and Affordable Care Act (PPACA) emerged as the result of political compromises, many applauded it as a step toward finally realizing the human right to health care in the United States. After all, the bar had been set quite low: because the United States produces poor health outcomes and shocking health disparities despite the highest health care spending in the world – driven by a for-profit health industry – the only way the country could go was forward. Or so it was hoped. Yet six months later we awake to news of children’s coverage dropped, sick kids being charged more, skyrocketing insurance premiums, employers’ shifting costs to workers, and insurers defending paper-shuffling as essential medical expenses. Everyone knew from the start that the reform would not be fully universal, with the Congressional Budget Office predicting 23 million people to remain uninsured, nor equitable, with access to care dependent on the payment of premiums, co-pays, and deductibles, nor accountable, with for-profit insurers setting prices and limiting access to doctors and services. Yet many had hoped that a little bit of universality would go a long way toward getting improvements for some. By the same token, the principle of “equity” was deemed just slightly too ambitious when insurance companies could simply be subsidized for selling their products to those working low-wage jobs. As far as accountability goes, it was considered safer to keep the enemy – our beloved insurance companies – as close as possible, rather than unnecessarily antagonizing it. If the reform stuck to a market-based insurance system – so went the reasoning – access could be within reach of more people without causing disruptions to those benefiting from the status quo. Except that some rather painful “market disruptions” are upon us now, with insurers dropping policies and raising rates in droves. But once again, advocates cling to their optimism; after all, the bulk of the reforms won’t come into effect until 2014, and once we plow through this disruptive period, all the pieces will fall into place. Or will they? In a turbulent week in U.S. politics that saw the president abandoning his promise of universal health insurance and the Supreme Court elevating corporate spending in elections to a human right – protected as free speech in the same way as human speech – human rights activists should take solace in the fact that giving up pretensions can be the first step to real change. This is particularly important for human right to health care activists who have long been dismayed with market-based health care proposals that blatantly fail to satisfy basic human rights standards. There was perhaps only one policy measure the U.S. needed even less than the opening of floodgates for vast new corporate political spending, and that was a health “reform” bill funneling millions of new customers to the for-profit insurance industry and billions in subsidies into the coffers of the…wait for it…very same industry. If this bill, in its Senate and House versions, now appears threatened by the Democrats’ loss of one Massachusetts Senate seat, a new opportunity has emerged to call for simple but meaningful health reform measures based on human rights. Many activists and advocacy organizations, including Amnesty, have consistently pointed to the fundamental flaw underlying the approach adopted by health reformers in DC, and urged them to treat health care as a human right, not a commodity. Yet the reform bills failed to meet the human rights principles of universality, equity, and accountability. Rather than guaranteeing universal health care, they excluded many millions of people from access to coverage and care. Instead of ensuring that care would be available for those who need it, the bills made access for most people contingent on their ability to purchase a private insurance plan. And rather than holding the private sector accountable for protecting the right to health, the bills perpetuated the industry’s focus on their bottom line. The rapidly faltering popularity of this market-based approach creates a new opening for demanding simple but systemic policy changes that move the U.S. system toward treating health care as a public good shared equitably by all. A Medicare-like public health insurance program for everyone in the U.S. could guarantee progressively financed, publicly accountable, and fiscally sustainable universal coverage. Therefore, building on the success of Medicare and expanding it to more and more people below the age of 65 can be a key component of a rights-based reform strategy. It is equally important to secure and expand the health rights of poor and low-income people through guaranteed public coverage provided by Medicaid and the Children’s Health Insurance Program (CHIP). Without a progressive expansion of publicly financed and administered health care, it will remain virtually impossible to ensure that people’s health needs are prioritized over market incentives to deny access to care. 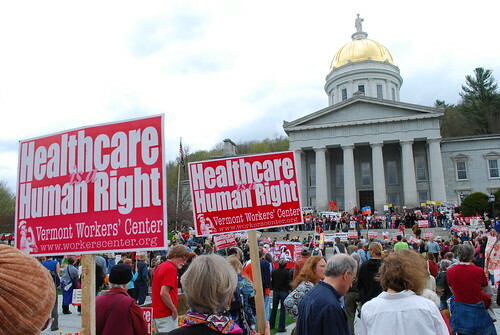 Rally at the Vermont State House in Montpelier. Communities across the country are demanding the human right to health care, while Congress is tweaking its latest version of health insurance legislation that continues to treat health care as a commodity. This unacceptable discrepancy between public will and corporate power in Washington, DC, is being challenged by state-based campaigns for the human right to health care. Activists in states such as California and Vermont have their eyes on a prize much grander than anything Congress is willing to consider: single payer health care at state level. So it’s no coincidence that it is Vermont’s U.S. Senator Bernie Sanders (I) who seeks to change the health bill under discussion in the U.S. Senate by introducing an amendment that would make it easier for states to go it alone and implement a Medicare-for-All, publicly financed health care system in their state. July 30, 1965: President Lyndon Baines Johnson signs Medicare into law. Also seated is President Harry Truman, recipient of the first Medicare card. Medicare turns 44 years old today. It’s in good health. The program remains efficient — Medicare’s administrative costs are about three percent, much less than that of employer-based private insurance (five to ten percent of premiums for large companies, 25 to 27 percent for small ones) or individual private insurance (40 percent of premiums). Medicare, of course, doesn’t devote administrative dollars to denying coverage or claims on a case-by-case basis. Also, unlike the private insurance industry, it doesn’t seek out profits. Actually, Inglis doesn’t have it right either: Medicare is national government financing for health care, not government provision of health care. Medicare-financed health care is provided by private doctors, clinics and hospitals. Medicare is an example of what journalist T. R. Reid calls the National Health Insurance model, like the health care systems of Canada, Taiwan and South Korea. Canada, in fact, calls its system “Medicare” too. Here in the United States, Medicare is a model for treating health care as a public good rather than a commodity: a system in which benefits and contributions are fairly shared, one that works for everybody, rather than one in which health care is something to be bought and sold — and tough luck for those who can’t afford it. Medicare is like a fire department that protects everyone’s house — like the fire departments we actually have in this country. The private parts of our health care financing system are like fire departments that only protect the houses of people who can afford to pay. The current health care reform process offers an opportunity to move towards establishing health care in this country as a public good and a human right. A key step is establishing a new Medicare-like public health care plan that guarantees access for all, something we’re calling on Senate leaders to do. The Senate is the key battleground now. Of all the Congressional committees with health care jurisdiction, the Senate Finance Committee is least hospitable to a public plan, and has yet to pass a bill. The eventual Finance Committee bill faces a bruising reconciliation with the Health, Education, Labor and Pensions Committee bill that’s already passed. And there will be a further fight when the full Senate debates and votes on the merged bill. In honor of Medicare’s birthday, tell Senators Baucus (chair of the Finance Committee), Dodd (HELP vice chair, running the committee with chair Ted Kennedy ill) and Reid (majority leader) to ensure the final Senate bill provides a Medicare-like public health care plan for all. Over the looming August recess — the Senate is scheduled to adjourn next Friday, August 7 — everyone with a vested interest in keeping health care a commodity will be working as hard as possible to close the window on a new Medicare-like public plan. Which makes the delaying tactics we’re seeing on the Hill that much more galling. Health care legislation doesn’t have to take this long. In 1965, after all, in the first year of Johnson’s second term, Congress passed Medicare in late spring, in time for the president to sign it into law on July 30 — 44 years ago today.